In this article, Chemical Vapor Deposition process is explained in detail. The epitaxial deposition, uses, and also the epitaxial growth of silicon is explained in detail. Doping and Autodoping, Epitaxial Reactors, Epitaxial Growth Process, their advantages and disadvantages are also explained. The different types of CVD reactors and their advantages and disadvantages are also explained briefly. To know the various steps that are used to fabricate silicon devices, click on the link below. Chemical Vapor Deposition (CVD) is the deposition of a solid material onto a heated substrate through decomposition or chemical reaction of compounds contained m the gas passing over the substrate. Many materials such as, silicon nitride, silicon dioxide, non-crystalline silicon, and single crystal silicon, can be deposited through CVD method. A special method in CVD, called Epitaxy or Epitaxial Layer Deposition or Vapor-Phase Epitaxy (VPE), has only a single-crystal form as the deposited layer . This process is usually carried out for certain combinations of substrate and layer materials and under special deposition conditions. Silicon epitaxial layer on a single-crystal silicon substrate (homoepitaxy or commonly referred to as epitaxy). Silicon epitaxial layer deposition on a sapphire (Heteroepitaxy). Each one of these depositions will be described in this post. Epitaxy is referred to as an arrangement of atoms in a crystal form upon a crystal substrate, so that the resulting added layer structure is an exact extension of the substrate crystal structure. In other words, deposited atoms arrange themselves along existing planes of the crystalline substrate material. This will cause the deposited atoms to bond to the parent atoms to form an unbroken chain of the crystal structure. The structure of the grown epitaxial layer is thus a continuation of that single-crystal substrate. There is no difference between epitaxy and crystal growing technique. But where, in epitaxy a thin film of single crystal silicon is grown from a vapor phase upon a existing single crystal of the same material, in crystal growing, a single crystal is grown from the liquid phase, in contrast to the growth technique in epitaxy. Furthermore, epitaxial process involves no portion of the system at a temperature anywhere near the melting point of the material. Epitaxy was first developed so as to improve the performance of discrete bipolar transistors. The breakdown voltage of the collectorÂ was determined by fabricating the devices in bulk wafers using the wafer’s resistivity to determine the breakdown voltage of the collector. However, high breakdown voltages need high-resistivity material. This requirement, coupled with the thickness of the wafer, results in excessive collector resistance that limits high-frequency response and increases power dissipation. Epitaxial growth of a high resistivity layer on a low-resistivity substrate solves this problem. Epitaxy is also used to improve the performance of dynamic random-access memory devices and CMOS ICs. Epitaxial layers make it possible to control the doping profile in a device structure that available with diffusion or ion implantation. The physical properties of lire epi-layer differ from those of bulk material. For example, epi -layers are generally oxygen and carbon free, a situation not obtained with the crystal grown silicon. The most common example of epitaxy is the deposition of silicon epitaxial layer on a single-crystal silicon substrate. In this case the substrate and layer materials are the same, and this is called homoepitaxy. Here the epi-layer becomes a crystallographic continuation of the substrate. The CVD of single-crystal silicon is usually performed in a reader consisting of a quartz reaction chamber into which a susceptor is placed. The susceptor provides physical support for the substrate wafers and provides a more uniform thermal environment. Deposition occurs at a high temperature at which several chemical reactions take place when process gases flow into the chamber. There are a number of different chemical reactions that can be used for the deposition of epitaxial layers. Four silicon sources have been used for growing epitaxial silicon. These are silicon tetrachloride [SiCl4], dichlorosilane [SiH2Cl2], trichlorosilane [SiHCl3] and silane [SiH4]. Silicon tetrachloride has been the most studied and has seen the widest industrial use. The overall reaction can be classed as a hydrogen reduction of a gas. For understanding the above reaction, we should determine for the Si – CI – H system the equilibrium constant for each possible reaction and the partial pressure of each gaseous species at the temperature of interest. Equilibrium calculations reveal fourteen species to be in equilibrium with solid silicon. In practice many of the species can be ignored because their partial pressures are less than 10-6 atm. The hydride AsH3 does not decompose spontaneously as it is relatively stable because of the large volume of hydrogen present in the reaction. Interactions also take place between the doping process and the growth process. In addition to intentional dopants incorporated into the layer, unintentional dopants are introduced from the substrate. This effect is termed autodoping. Autodoping limits the minimum layer thickness that can be grown with controlled doping as well as the minimum doping level. The epitaxial layer deposition takes place in a chamber called an epitaxial reactor. There are three basic types of reactors. The three reactors have been explained in the figure below. Horizontal reactors offer lowest cost construction, however, controlling the deposition process over the entire susceptor length is a problem. Vertical reactors are capable of very uniform deposition but suffer from mechanical complexity. Cylindrical reactors are also capable of uniform deposition due to employment of radiant heating, but arc not suited for extended operation at temperature above 1200Â°C. A typical epitaxial growth process includes several steps as follows. A hydrogen carrier gas is used to purge the reactor of air. The reactor is then heated to a temperature. After thermal equilibrium is established in the chamber, anhydrous HCl gas is fed into the reactor. The HCl gas reacts with the silicon at the surface of wafers in reaction that is reverse of that given for [SiCl4+H2].This reverse reaction results in vapor-phase-etching of the silicon surface and usually occurs at a temperature between 1150 and 1200Â°C for 3 min. The temperature is then reduced to the growth temperature with time allowed for stabilizing the temperature and flushing the HCI gas. For [SiCI2 +H2] reaction, the graphite boat is heated to a temperature in the range 1150 â€“ 1250 degree Celsius. The vapor of SiCl4 and hydrogen as a carrier gas arc introduced into the lube for producing epitaxial layer. Once growth is complete, the dopant and silicon flows are eliminated and the temperature reduced, usually by shutting of the power. As the reactor cools toward ambient temperature, the hydrogen flow is replaced by a nitrogen flow so that the reactor may be opened safely. Depending on wafer diameter and reactor type, capacities range from 10 to 15 wafer per batch. Process cycle times are about 1 hour. The vapor-phase etching (VPE) described above is necessary to remove a small amount of Si and other contaminants from the wafer surfaces to ensure that a clear freshly etched silicon surface will be available for epitaxial layer deposition. When the concentration of SiCI4, is high, etching can still occur even when hydrogen chloride is not present due to a competing interaction. When reduction of SiC4 lakes place, the reaction gives rise to free silicon atoms. Atoms from the gas phase skid about on the surface of the growing epitaxial film until they find correct position in the lattice before becoming fastened into the growing structure. For producing doped p-type or n-type epitaxial layers, a number of gases can be metered into the reactor tube, including some very small amounts of doping gases, such as B2H6 [diborane] for boron doping and PH3 [phosphine] for phosphorus doping of the epitaxial layer. During the epitaxial layer deposition the dopant gas molecules react and become decomposed and the dopant atoms thus produced become incorporated into the epitaxial layer. Doping of the epitaxial layer is also achieved by adding controlled amounts of-the appropriate impurity in liquid form, for example, phosphorus trichloride or arsenic trichloride, to the silicon chloride. SiCl4 is non-toxic, inexpensive and easy to purify. The reaction making silicon from SiCl4 takes place only at surface and not on the boat or reaction chamber walls. The growth process is accompanied by the diffusion phenomenon which causes an exchange of impurities between silicon wafer and growing Film. This prevents the fabrication of an ideal step junction. SiCl4 process requires higher temperature than silane process and also has slower growth rate. Epitaxial layer deposition takes place at temperatures in the range 950 to 1250Â°C. Due to this, diffusion of impurities may occur across the epitaxial layer or substrate interface due to the deposition and high temperature processing steps. This will cause a blurring of the impurity profile in the region of this interface. But the main problem will be the deposition of a very thin and very lightly doped epitaxial layer on a very heavily doped substrate. The outdiffusion of impurities from the heavily doped substrate into the lightly doped epitaxial layer will blot out the sharp n/n+ transition that would otherwise be present at the layer-substrate interface. The influx of donor atoms from the substrate will reduce the effective thickness of the lightly doped epitaxial layer by 1 or 2 micro meter.Â To minimize this problem of outdiffusion from heavily doped n+ substrate, slow donor diffusants such as antimony and arsenic are often used for the doping of substrate in preference to phosphorus. Molecular beam epitaxy differs from vapor-phase epitaxy (VPE) in that it employs evaporation t [instead of deposition] method. Thus it is a non-CVD epitaxial process. Although the method has been known since the early 1960s, it has recently been considered a suitable technology for silicon device fabrication. In the MBE process the silicon along with dopants is evaporated. The evaporated species are transported at a relatively high velocity in a vacuum to the substrate. The relatively low vapor pressure of silicon and the dopants ensures condensation on a low-temperature substrate. Usually, silicon MBE is performed under ultra-high vacuum [UHV] conditions of 10-8 to l0-16 Torr. It is a low temperature process. Thus outdiffusion and autodoping is minimized. It allows precise control of doping and permits complicated doping profiles in he generated, This is useful for discrete microwave devices. A linear voltage -capacitance relationship is desired for varactor diodes used in FM modulators. For this linear doping profile is required, which is easily obtained with MBE. 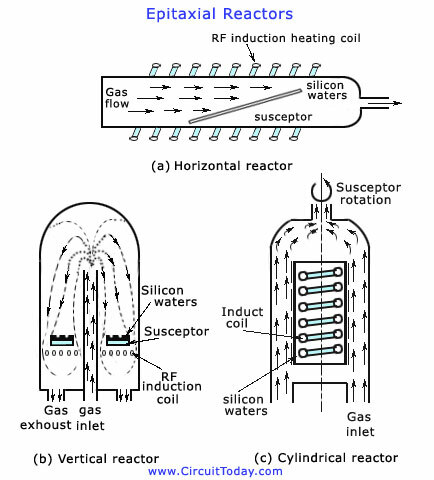 The figure below shows the four reactors commonly used for deposition. Diagram [a] shows an LPCVD reactor that is used to deposit polysilicon, silicon dioxide, and silicon nitride. The reactor consistsÂ of a quartz tube heated by a three-zone furnace. Te gas is introduced through one end of the furnace and pumped out f the other. The pressures inside the reaction chambers vary from 30 to 250 Pa, with a temperature range between 300 and 900 degree Celsius. WafersÂ are kept in a quartz holder and are kept to stand in the vertical position, and perpendicular to the gas flow. In special cases, special insertÂ are used so as to bring a drastic change in the dynamics of the gas flow. Such a reactor can easily hold 150 millimeters diameter wafers. Each run processes 50 to 200 wafers with thickness uniformities of the deposited films within Â±5%. An APCVD reactor is shown in diagram [b]. This reactor is used to deposit silicon dioxide. The samples reach the reactorÂ through a conveyor belt. Due to the high speed flow of nitrogen, gas curtains are formed which cover the reactant gases flowing through the centre of the reactor. The samples are heated by convection. The advantages and disadvantages of APCVD reactors are as follows. 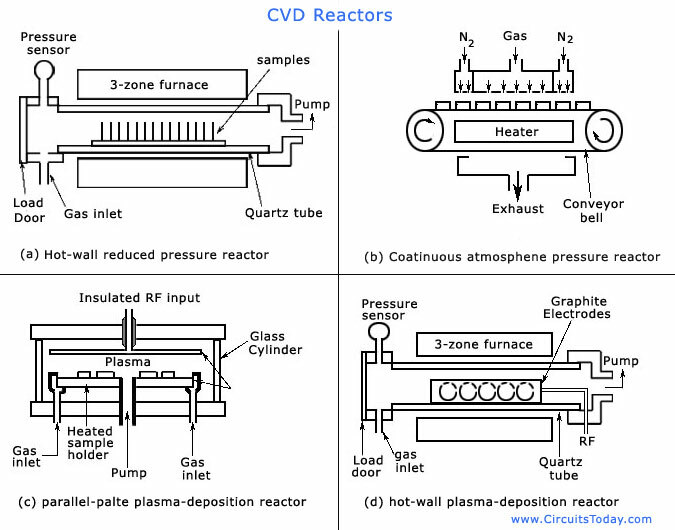 Diagram [c] shows a Plasma-Enhanced CVD (PECVD) or Plasma Deposition Reactor which is a radial-flow, parallel-plate type.Â The reaction chamber is a cylinder, usually glass or aluminium, with aluminium, plates on the top and bottom. Samples lie on the grounded bottom electrode. An RF voltage is supplied to the top electrode so as to create a glow discharge between the two plates. This causes the gases to flow radially through the discharge. These gases begin at the outer edge and take the direction towards the centre. But,Â if needed the pattern of the flow can also be reversed.Â Resistance heaters or high-intensity lamps heat the bottom, grounded electrode to a temperature between 100 and 400Â°C. Due to its low temperature deposition, this reactor finds its application in the plasma-enhanced deposition of silicon dioxide and silicon nitride. Diagram [d] shows a PECVD or plasma deposition reactor of Hot-Wall Type. This reactor will help in solving most of the problems that occurred in radial-flow reactor.Â The reaction takes place in a quartz tube heated by a furnace. The samples should be held vertically, and that too parallel to the gas flow. The samples should be supported with the help of materials like long graphite or aluminium slabs, kept in the electrode assembly. A discharge is produced in the space between the electrodes. This discharge is produced by the alternating slabs that are connected to the power supply.